"I was late for my flight again, not an organized person I was then, my chores, business and personal, had always been more last minute than I had wished for. That was the me of three years ago. Almost like splashing on my Bobbie Brown lipstick, grabbed my Dior bag, rushed towards the hotel main entrance, a cab's door was already opened (the Japanese are marvelous people!). It was on an escalator at Narita that I met him. Me going up, he going down in parallel. My heart nearly popped out, it had been four years after University that we saw each other last, not terribly good friends then, but nice impression, an excellent amateur cellist then and an IT man by profession now, I mean today. I didn't know how I could possibility take out my business card in such split second, I did, and I quickly slipped it onto his palm, nice and warm, his mouth was wide opened, and I smiled. We married a year later." I was told this story and was touched. 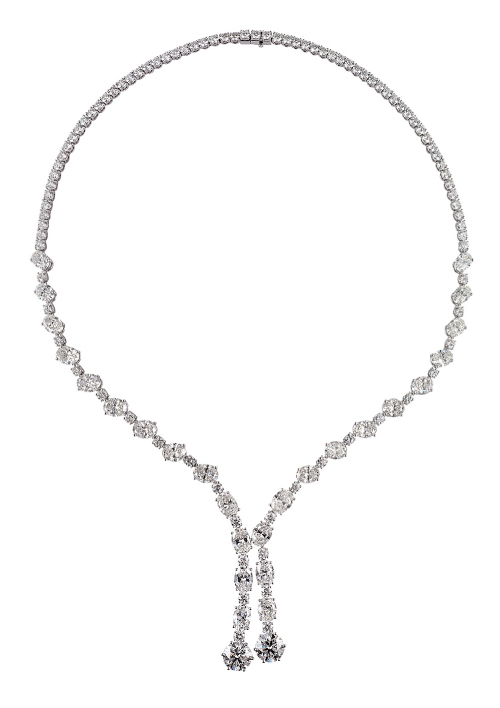 It inspired me to create a bespoke diamond necklace for a lady customer of mine. This stunning piece was set with two 2-carat diamonds both of GIA certified VVS clarity in G color as the focal point, completed with a generous use of medium ovals and smaller rounds. The complete project was done in-house, including sourcing the diamonds. A chance encounter can be very precious, in every sense of the word!